Security fences require extra equipment such as gated access points, lighting, cameras, razor wire or electric wire to protect the enclosed space from intruders. 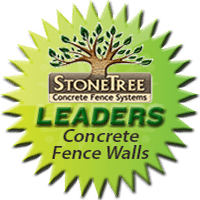 Security equipment installs easily on StoneTree® Fence Walls, because of the unique design of the Combo-Cast™ panels. Electrical wiring threads through the column section of the wall panel and attaches to the light fixture, camera or other equipment the security fence requires. Security equipment such as lighting and cameras may be mounted on the fence column cap. Razor wire or electrical fence wire may be installed either on top of the fence wall, or mounted to the side of the wall with brackets. Automatic gate openers may use push-code access which is separate from the fence wall or automatic sensors which are hidden by the fence wall. Our security fences are custom designed to meet the individual needs of our customers. This allows us to offer the very best security walls available. Along with any combination of our security equipment, we offer a large selection of heights and widths so you can get exactly the wall you need. In addition to all the security features offered with our fence walls, our security fence walls are made to accent the area they surround. They can be designed and colored to enhance any area they are protecting, which makes them more appropriate than some traditional utilitarian fences. This is what makes us the best security fence company in the industry. Our unique systems have been created to ensure no detail on our fences is overlooked.